The success of Barefield Pediatric Dentistry is due in part to the overwhelming support we get from YOU, our patients!! We love hearing that patients and their parents feel safe and comfortable at our office. 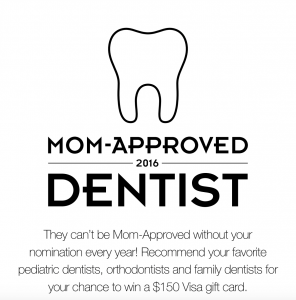 Please click the link below and vote for Dr. Barefield as a “Mom-Approved” Dentist so that other families in the metroplex might learn more about our office and experience the same treatment and care that you all receive. Thanks in advance! !